Sports Personality. Professional Speaker in Motivation, Inspiration, After dinner & Teambuilding training. New Zealand's most successful Olympian. Ian Ferguson has taken the same attributes that made him a World Champion and used them in business and teambuilding. Inducted into New Zealand Hall of Fame in 2003. When Ian Ferguson first competed at an Olympic Games in 1976 and even again when he was one of the tiny team in Moscow in 1980, few would have seen him as one of New Zealand’s greatest sportsmen. Yet that’s what he became – two gold medals in one day in the Olympic Games in Los Angeles in 1984, then another the next day. Four years later, in Seoul, there was another gold medal, plus a silver. There were also world titles in 1985 and 1987 plus several world silver medals. Ian Ferguson is the only New Zealander to have competed in five Olympic Games and his four gold medals is also a record. But that wasn’t all. Ferguson also won gold and silver competing for New Zealand in surf lifesaving. In the same manner as many other aspiring young New Zealanders, Ian began his successful and rewarding sporting career with school-boy representative rugby and running honours. He was also the Palmerston North Boys High School swimming champion, displaying a love of the water and indicating that the potential was there for better things to come. There are not many water sports that Ian does not enjoy and perform well, including water skiing, surfing and surf ski paddling. He has excelled at surf-lifesaving, with four New Zealand Iron Man titles to his credit, as well as New Zealand Representative Team honours. The highlights of his career however are his achievements as a canoeist. 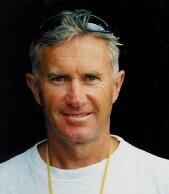 Ian first started competing nationally in the kayak in 1974. He attended his first Olympic Games in Montreal, Canada, in 1976. Some of the most memorable performances in New Zealand sporting history were recorded in Los Angeles, in 1984, where Ian became the first and only New Zealander to win three Gold Medals at one Olympic Games. His outstanding success as an individual in the K1 500m, with Paul MacDonald in the K2 500m and with Alan Thompson, Grant Bramwell and Paul MacDonald in the K4 1000m, was applauded by the public of New Zealand who looked upon Ian as the newest of the sporting heroes. Ian was further rewarded by New Zealand when he won the prestigious Sportsman of the Year Award later on that year. In 1985 Ian won Gold at the 1985 World Championships in Hazewinkel, Belgium and later that year was made a Member of the British Empire in the New Years Honours, for his services and achievements in the sport he loves. At the 1987 World Kayak Championships in Duisburg, Germany, Ian won Gold in the K2 1000m and Silver in the K2 500m, teaming up in both races with partner Paul MacDonald. At the 1988 Seoul Olympic Games, the duo reversed their placings of the previous year and won Gold in the K2 500m and Silver in the K2 1000m events. Ian and Paul raced together since 1980. They are the most successful pairing in World Gold medals with five World Gold medals. Between them they have 11 World Championship medals and 10 Olympic medals. Ian retired from International competition after the 1992 Barcelona Olympic Games. Since then he has continued kayaking at a recreation level to keep fit enough to compete in several multisport events as well as and occasional National Kayak Championship and New Zealand Surf Life-saving Championships. Ian also became well known to the New Zealand public for his sporting skills in the much acclaimed television show, Clash of the Codes, twice being in the winning team. Also he was the super-judge for the four year stint of Top Town. 1996 was the Centenary of the Olympic Movement and each country was given a Bronze Statue by the International Olympic Committee to present to their most outstanding athlete throughout those 100 years of competition. The New Zealand Olympic Organisation awarded Ian with the highest honour it could bestow on one of its athletes, naming him “Olympian of the Century”. Since retiring internationally, Ian has been able to spend more time building up his kayak business, Fergs Kayaks, which he started at the end of 1990. The business has become a fast growing enterprise (New Zealand’s largest kayak outlet) dealing in all aspects of kayaking, involving retail, general hire, coaching, guided trips, school groups and team building. Inline skating has become a popular past-time in Auckland and Ferg’s Kayaks is the leading hire outlet on the waterfront. The success of Auckland led Ian to open a similar shop in Wellington with the added attraction of a 12m rock-climbing wall. The shop is situated in a prime location on the waterfront at Queens Wharf.